You'll also have the option of joining the Kinobody Member's Only Forum and the Kinobody Private Facebook Group. Everything that you 100% need to get great results from this program is included in two PDF guides. They are quite concise and very easy to understand. Greg won't bore you with useless statistics and "science talk". Instead, he gives you the step-by-step instructions to building the body of a superhero. You'll save a lot of time and frankly, do you even care why the training methods work? You care about results.and that's exactly what this training program will deliver. Like I mentioned earlier, there are a bunch of free bonuses that come with this program. I haven't really used any of them to be honest because everything you need is in the 2 PDFs. However, some of the bonuses will be helpful to you depending on your personal situation. For example if you are an athlete, the Cardio PDF is very important for you. Others will benefit from the style guides or the dating advice. Ultimately, every person will benefit from the bonus material that is most relevant to them. The bonuses are a little random if you ask me. but you can't complain since you get them for free anyway. If they help you, great! If not, who cares. Greg has two ten-minute videos where he shows you exactly how he wants you to do the exercises in this program. He doesn't always recommend textbook form so you'll want to watch these videos. I have found his recommendations to be both effective and safe. Obviously if you feel any pain during these exercises, stop doing them or change your technique. Getting injured is never worth it in the long run. I'm sure Greg would agree with that having gone through an injury recently. 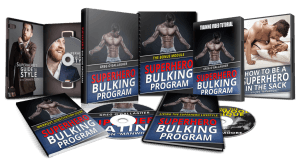 How Does the Superhero Bulking Program Work? Obviously, I can't give away the whole program in this post. I don't want to either because I know you'll get better results if you follow the full routine. However, I want to give you a rough overview of what this program includes. That should give you a better idea whether Superhero Bulking is the right choice for you. I'm going to include the main elements that make this program so effective. If you know that you don't like training or eating in these ways, don't follow this program. Training and gaining muscle should be enjoyable. If you already know that you won't like it, don't even bother starting. I will encourage you to keep an open mind though. Unless you really hate these training principles, you'll find that Superhero Bulking is a fun program to use. The Superhero Bulking Program is built on the solid foundation of. Those are the key elements that make this lifting routine so effective for adding muscle to advanced lifters. For the exact program and how to apply those training principles, you'll need to buy the program here. Greg is one of the few fitness experts who isn't scared of going against the masses. His methods are at times unconventional; but always brutally effective. He simply doesn't care what others say about his methods because he knows they work. Not only do they work for him, but they have also worked for tons of his clients. And despite the fact that he doesn't constantly cite scientific sources, he understands exercise science very well. Anyone can find a study to prove their opinion but that's not what Greg does. Instead, he studies the exercise science knowledge and tries it out himself. If it works for him, he'll use the same strategies with his clients. Only then, does he publicly recommend a training system. All times are GMT +6.5. The time now is 07:22 PM.